California remains a tinderbox due to drought conditions. 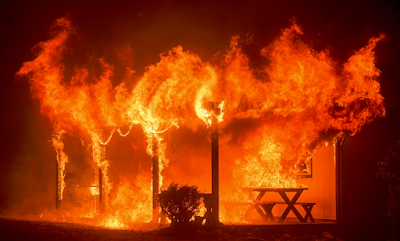 Fires rage in multiple places and Governor Brown has declared a state of emergency with a new fire about to consume San Andreas, a town 60 miles East of Sacramento. The Guardian reports Explosive Wildfire Threatens California Mountain Towns as Blaze Intensifies. A mountain town is standing by to evacuate on Saturday and residents across a huge swath of northern California have been warned of “explosive fire conditions” as a fierce wildfire across more than 100 square miles suddenly intensified. California governor Jerry Brown has declared a state of emergency for the counties experiencing the inferno, as it approaches the town of San Andreas, about 60 miles south-east of Sacramento in the Sierra Nevada region. Some homes have been engulfed and thousands are threatened with imminent destruction in the path of flames that are spreading over steep landscape. The gradients help the fires grow by sending heat up slopes and increasing ground temperatures ahead of the flames while making it extremely difficult for the emergency services to tackle the blaze. A blaze that covered one square mile on Thursday quickly burned more than 100 square miles and was only 5% contained by Friday evening. By Saturday afternoon, firefighters had gained some ground and containment had increased to about 10%, fire officials said. Meanwhile, in central California between the city of Fresno and the Kings Canyon National Park, firefighters are digging trenches to try to stop wildfires reaching a growth of ancient giant sequoia trees in the Sierra Nevada, where the towering specimens are often found to be 3,000 years old. The Grant Grove of sequoias is named for the majestic General Grant tree in its midst, which is 268 feet tall. Lightning caused a fire more than a week ago that has now spread to an area of 40 square miles. The Guardian has many images. This is the lead image.